This soybean field west of Hillsboro was benefitting Friday from additional rainfall, even though soybeans in the central and northern parts of Ohio are in danger of being lost because of too much precipitation. Wet soybean fields have farmers in central and northern Ohio worried about diseased crops or yield loss, but local County OSU Extension agriculture agent David Dugan said that this week’s rain has been a blessing for southern Ohio soybean farmers. Dugan said Friday that the area he covers had 1 to 1.5 inches of rain this month before this week. He said the problem area is north of I-70, where farmers have seen up to 10 inches of rain or more, and the remnants of Tropical Storm Bill could add considerably to those totals this weekend. He added that the situation will probably get worse this weekend because of the forecasts of additional rain. Heidlebaugh grows soybeans, and says he will probably lose about 5-6 acres of his crop. “I am in a pretty flat area and not close to any river,” he said. He said the flooding was as bad in neighboring Van Wert County and those farther north. He said he is concerned about disease with all the standing water in fields, which could lead to the loss of portions of the 2015 crop. 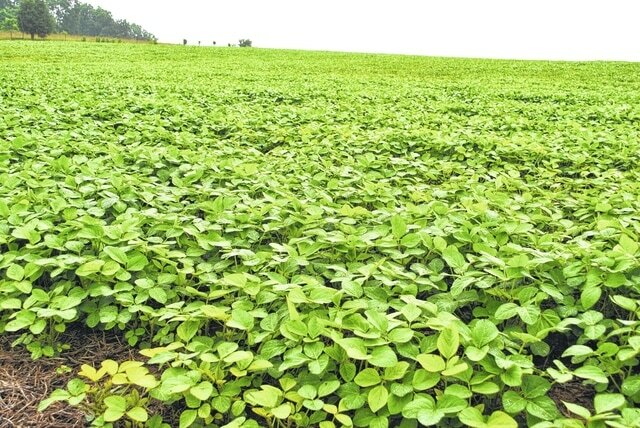 In fact, if soybean crops at the V2-V3 growth stage are flooded for three days, growers could face a 20 percent yield loss, said Laura Lindsey, a field crops expert in the College of Food, Agricultural, and Environmental Sciences at The Ohio State University. Growers with soybean fields flooded for six days could stand to lose up to 93 percent of their crops’ yield potential, said Lindsey, who is also a soybean and small grains specialist with Ohio State University Extension. OSU Extension is the college’s outreach arm. “Things are a little bit scary for growers right now,” she said. “The continued rain falling on already saturated soils across the northern and west-central part of the state is going to be tough on soybeans. “Based on OSU studies of flooding’s impact, soybeans at the V2 and V3 growth stage flooded for six days or more could wipe out an entire crop,” she said. In Fulton County, farmer Allen Willson has about 1,000 acres of soybeans and more than 1,000 acres of corn planted. He said Friday that he is seeing some “yellowing” of the corn because of the standing water in his corn fields, and has lost about 10 acres of his soybeans to the flooding. “Rain? We have had plenty of it,” he said. Since the end of May, he said there have been just a few days when he has been able to work his fields. Statewide, for the week that ended June 14, soybeans were 95 percent planted and 87 percent emerged, according to the U.S. Department of Agriculture crop progress report. That compares to soybeans at 92 percent planted at the same time last year, with 78 percent emerged during that same period, the USDA said. Temperatures 80 degrees and higher will cause submerged soybeans for 24 to 48 hours to likely die, Lindsey said. But cool, cloudy days and clear nights increase the survival potential of a flooded soybean crop, she said. “And if the waters recede quickly and the plants receive some light rain, they can recover, but we’ll probably still experience some yield loss,” Lindsey said. • Poor nodulation: Soybean roots have nodules on them that capture nitrogen that aid in the plant’s growth. Wet soils reduce nodulation and can result in yellow, stunted soybeans. • Disease: Flooded and saturated soil creates optimum conditions for water molds that are common across the state. Soybeans will have brown roots, sometimes with dark brown lesions on the roots, and the tissue can be brown to tan. Lindsey said that growers will have to wait for the water to recede and the fields to dry to get an idea of how the soybeans have fared. Some growers may be faced with deciding if they need to replant, although it is getting late in the season for replanting, Lindsey said. The National Weather Service in Wilmington is calling for a 50 percent chance or more of thunderstorms every day from Saturday through Monday in Highland County. Reach Gary Brock at 937-556-5759 or on Twitter @GBrock4. Jeff Gilliland contributed to this story.